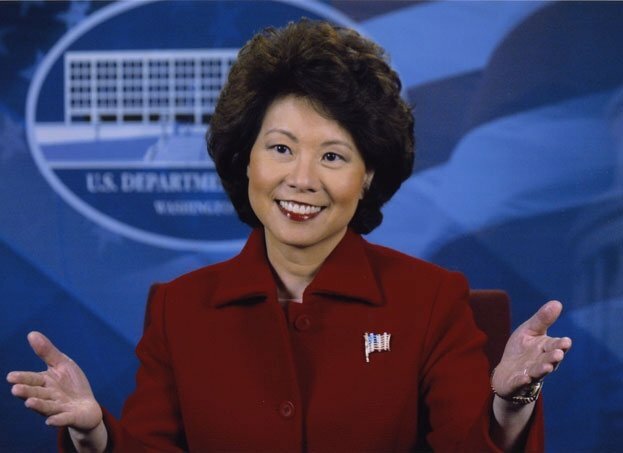 The US Senate on Tuesday confirmed Elaine Chao as Secretary of Transportation by a vote of 93 to 6. And the American Maritime Partnership gave her a thumbs up, noting her background in government and her specific knowledge of maritime matters. The US Maritime Administration (MARAD) falls under Transportation’s umbrella. It promotes waterborne transportation and covers aspects of shipping, shipbuilding, port operations, environment, safety and national security. Chao has a wealth of experience in government. She is a former Secretary of Labor (under President George W. Bush) and a former Deputy Secretary of Transportation (under President George H. W. Bush). Her maritime bona fides include being Deputy Administrator of MARAD (appointed in 1986) and Chairwoman of the Federal Maritime Commission (FMC) from 1988-89. And she is the wife of Senate Majority Leader Mitch McConnell (Republican of Kentucky). Her father, James S.C. Chao, is founder and chairman of Foremost Maritime Group, a New York-based bulk shipping company. President Donald Trump has called for a $1 trillion investment in the nation’s infrastructure and that is sure to be a big part of Chao’s job. How much of any infrastructure boost would go to seaports and the maritime industry remains to be seen. She is also likely to see occasional challenges to the Jones Act on her watch.